Trainco Truck Driving Schools announces the award of a Two (2) year contract with the Ohio Dept. of Jobs, and Family Services (ODJFS), to provide truck driver training to re-entering offenders. This is a joint effort between Trainco and the Ohio Department of Rehabilitation and Correction (ODRC). It provides CDL training to ODRC clients who are re-entering the workforce. 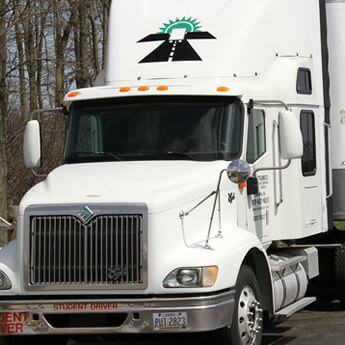 This vocational training gives those students a great foundation for a career as a commercial truck driver, in an industry which is experiencing a serious driver shortage. “Our training prepares re-entering offenders for good-paying jobs which not only helps their families, but also helps ensure that when they are released, they do not re-offend; i.e., ‘Going home means staying home,'” said Ken Howell, Trainco, Inc. President. Trainco was founded by Mr. Ken Howell in 1996, and because of its solid reputation for customer service, and affordable tuition, expanded to its present campus at 26718 Oregon Road, Perrysburg, Ohio, in 2001. Since that time, Trainco has opened campuses in Detroit, Ann Arbor, and Lansing, Michigan. Its curriculum is licensed, and approved by both Ohio, and Michigan. Since its inception, Trainco has graduated over 10,000 students, and has a 90%+ placement rate. In the past several years, the trucking industry has experienced a serious shortage of qualified, licensed professional drivers. Carriers have idle trucks because they can’t find enough dependable, capable drivers” said Mr. Howell. He also commented that,” We are helping fill those openings, by partnering with both private, and public sector sponsors, such as ODJFS, ODRC, and Cuyahoga Community College. Trainco strongly supports this ODJFS/ODRC initiative, because it provides re-entering citizens strong financial incentives to not re-offend. “That is good for them, their families, and the taxpayers,” said Mr. Howell, who also observed that, “I never realized when an offender is sent to prison, society pays twice – not just to house and feed them, but it also ends up providing support services to their families. Ohio taxpayers are clearly making a good investment here, because Trainco truckers will be breaking the chains of both recidivism, and dependency.” To make this happen, Trainco has worked closely with ODRC Director, Gary C. Mohr; Deputy Director, Annette Chambers-Smith; and William Eleby, Administrator, Operation Support Center.